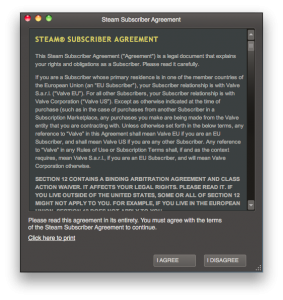 Just updated Steam on my Mac, and on relaunch I get this ‘nice’ Steam Subscriber Agreement notice that I need to agree to before continuing further. Not wanting to try reading the whole agreement in white text on a black/grey background, I thought take advantage of the Click here to print link (and turn it into a PDF). But it does nothing. If you are going to put a way to print things, do you think it would be good to check it works? No, I suppose, the stand use-case for testing only includes clicking the I Agree button. I mean, why would you bother checking people’s ability to understand the licence agreement? 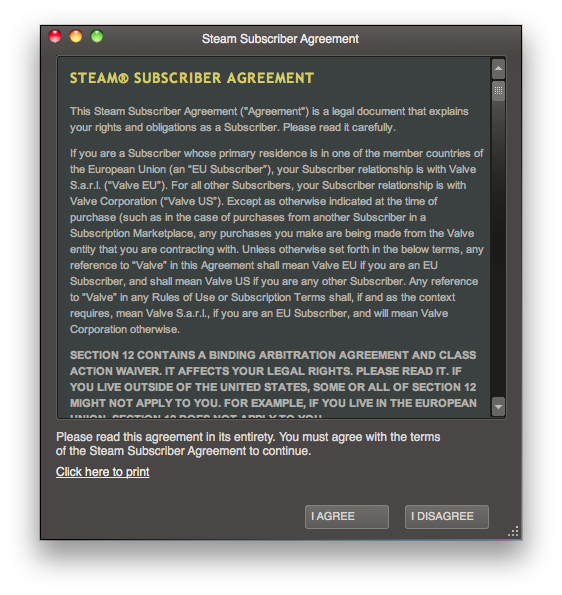 This entry was posted in Games, Mac and tagged computer games, game, Steam, test. Bookmark the permalink.